Who says you can’t make Winter clothes fun and trendy? Make a T-shirt dress part of your Winter 2017/2018 wardrobe. I think that for the first time, I am actually starting to enjoy the cold. And you know why? It is because I have discovered the importance of layering. The obvious right? Yes, I know, but I am taking layering onto a whole new level this Winter and making sure that I stay warm. I am always the first to feel and complain about the cold. You will be damned if you serve me ‘hot’ chocolate that is cold! My friends know that of me, I am not a happy bunny when it comes to drinking cold chocolate out of a cup. This one caught my eye. I mean, what would the world be like if there were no women around? Well let us not ask any guy that. Their response would be: drama free, less headache and a long list of reasons. We are the creators of all good things, we make things happen, we stand up for ourselves, we get on with things even in times of trouble. Anyway, back to the T-shirt dress. How I layer? Well, firstly I have two cami’s underneath this tee. Oh yea TWO! And one is a heat-tech warmer. Uniqlo, what would we do without you? See some links below. A thick knee length cardigan which I have collected a few of my favourites below. And for the shoes. You can still rock an ankle boot, but be sure to layer up using pop socks and thick wollies. This look is worthy of a #Streetstyle don’t you think? 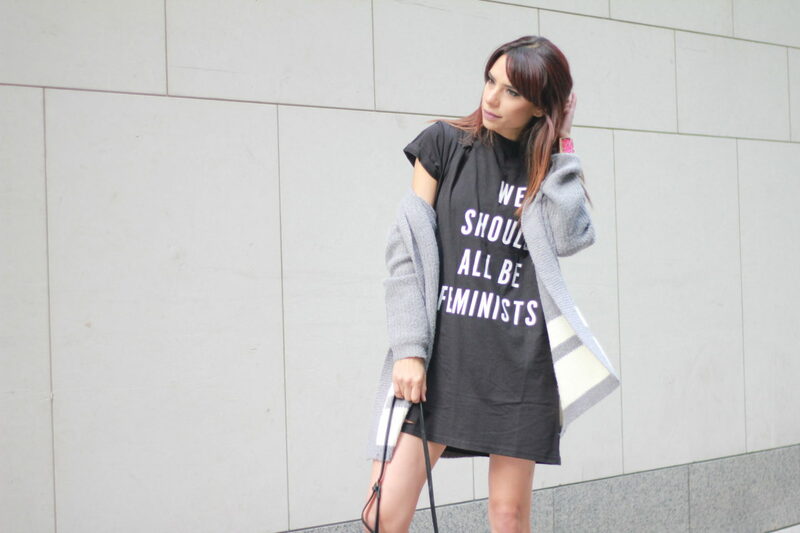 How do you rock your T- shirt dress? Layering is definitely a key to winter wardrobe. I’ve also been trying out some shirt dresses this season.